Wavetek 175 compatible Arbitrary Waveform Generator - GP1650W | Marvin Test Solutions, Inc. 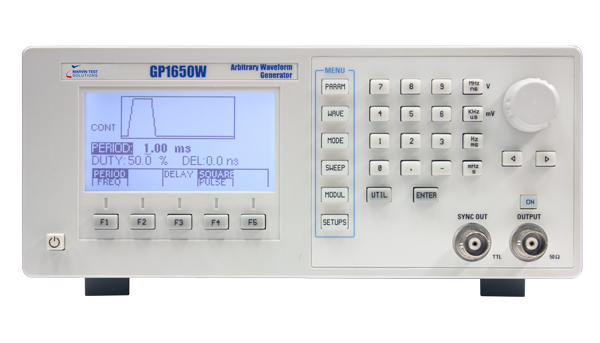 The GP1650W arbitrary waveform generator (AWG) is a single channel programmable instrument capable of generating user defined waveforms or predefined sine, square, triangle, ramp up, ramp down and noise waveforms. The GP1650W is designed to be form, fit , function compatible with the Wavetek 175 waveform generator. The GP1650W arbitrary waveform generator supports simulation of complex waveform events. The waveforms can be executed using an internal clock with a programmable period from 20 ns to 150 sec or via an external clock. The GP1650W offers an output voltage range of up to 10 VPP into 50 Ω with a separate offset generator. Very low amplitude signals can be generated with offsets of up to ±5 V. The output can be attenuated and filtered to obtain low level spurious and noise. The output waveform can be continuous, triggered, gated or burst using an internal, external or manual trigger. The GP1650W offers 256 K points of waveform memory and 4,096 possible levels for each address (12 bit vertical resolution), providing an array of over 1,048 million points for specifying virtually any waveform which could be mathematically generated, copied from a file, or captured by a digital oscilloscope. Waveforms can be defined point-by-point or predefined, such as sine, square, triangle, and ramp up / down. For specialized applications, waveforms can be loaded into memory and then edited as needed. The GP1650W incorporates a menu driven front panel operation. An autoline feature makes waveform editing and generation simple. For each operational mistake, an error recognition and display sequence guides the user to the correct panel selection. The parameter values may be entered or changed using the numerical keypad or the rotary knob. Continuous Output a continuous waveform with programmed amplitude and offset. Triggered Output is quiescent until triggered by an internal, external, GPIB or manual trigger, then one waveform period is generated at the programmed point rate, amplitude and offset. Gated Same as triggered mode except waveform is executed for the duration of the gated signal. Once gate deactivates, the last waveform’s period continues to completion. Burst Same as triggered mode, but will generate a predefined number of waveform periods from 2 to 999,999. AM Generator can be amplitude modulated by an external signal. Point Excecution Rate 50 MHz to 0.0066 Hz with 4 digits resolution and 0.01% accuracy in continuous mode. ±3% accuracy in triggered mode. Risetime < 15 ns for -2047 to +2047 data change at maximum 10 VPP amplitude, into 50 Ω. Range -5 V to +5 V into 50 Ω. The offset range is independent from the amplitude range. Sync Output Positive TTL pulse at selected clock rate. Programmable at any point between selected Start and Stop values. Output impedance is 50 Ω nominal. Marker Output Positive TTL pulse with a minimum width of one programmed clock rate. Up to four (4) markers available at user selected addresses. Output impedance is 50 Ω nominal. Clock Output TTL levels square wave at the point rate of the individual channel. Output impedance is 50 Ω nominal. Trigger Input Range is +10 V to -10 V, with 10 mv resolution, 5% accuracy and with selectable slope. Maximum trigger frequency is 15 MHz with the minimum of 25 ns pulse width. The sensitivity is 250 mVPP, with a 1 kΩ nominal input impedance. Hold Input TTL compatible. A Hi-level holds arbitrary execution. AM Input 5 VPP range for 100% modulation. Bandwidth is from DC to 20 kHz (min). Input impedance is 10 kΩ nominal. Clock inputs TTL compatible. Maximum 50 MHz frequency with a minimum of 10 ns pulse width. Compatability Conforms to IEEE488.2 and is compatible with SCPI (Standard Commands for Programmable Instruments). Subsets SH1, AH1, T6, L4, SR1, RL1 PPO, DC1, DT1, CO, E2.